I absolutely adore going back to visit the city. People always ask me if I miss living there. The answer is: sometimes. There are times when I miss it a lot. Especially when I look back through old pictures of my wonderful friends and I doing something awesome in the city. Then there are times when I'm driving to work and I don't pass a single car... and I don't miss the hustle and bustle. Basically, I am so glad that I got to live there while I was in college. For me, it was the perfect age to fully enjoy the madness. I loved it with a passion. Now that I'm in a serious relationship with the most wonderful man on the planet, we are starting to talk about planning our life together. This involves a lovely little home on lots of land, a garden, a dog and eventually babies. So domestic and wonderful and peaceful. I can picture us buying a tiny old house with lots of character, eating dinner on a blanket on the floor until we get a dining room table, painting the walls and not resisting the urge to smear paint on each others faces... happy future plans. Very happy. Luckily, Michael is the adventurous type. He is always up for going back to visit the city for the weekend. Pretty much every time I have the spontaneous urge, he is right by my side. 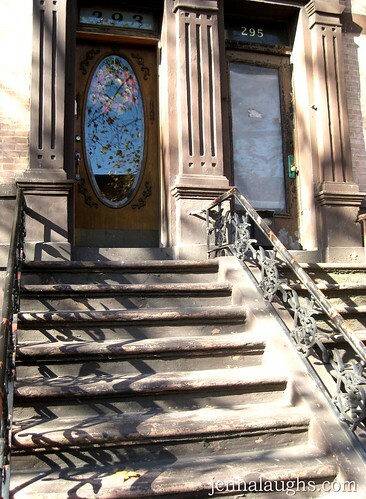 I love their stoop. And their fall wreath. Just thought that needed to be said. 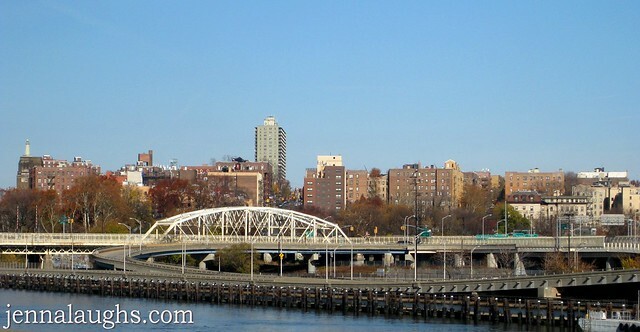 This past weekend, Michael and I drove up to the Bronx, New York for another awesome weekend. On Saturday, we enjoyed a morning to ourselves in Manhattan. We took the 6 train downtown to a camera store on 22nd street. 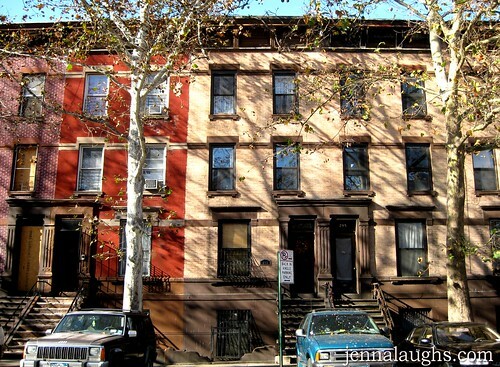 Then we walked 10 blocks north, stopping along the way to eat lunch a brick oven pizza place. 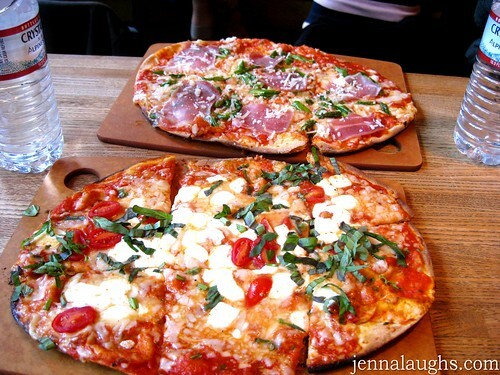 Note to self: make these pizzas. Michael got prosciutto, roasted asparagus and parmesan pizza. I got classic margherita with fresh basil. 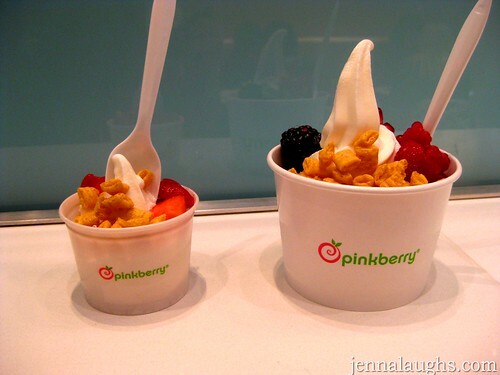 This was quickly followed by Pinkberry frozen yogurt. Go there. Mine is the pathetic one on the left. I was trying to be good. I ended up eating some of Michael's too. 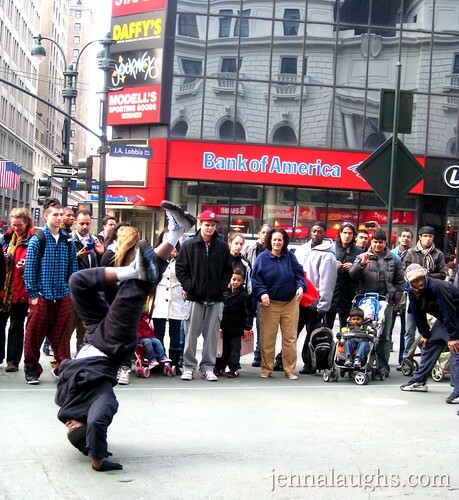 When we reached midtown, we became super tourists and stopped to watch these guys. Mad skills. After that, we took the train to the Upper West Side to Central Park West to meet my amazing, wonderful friend Lauren and her fiance Evan. And then the highlight of my Saturday: Lauren and Evan's engagement pictures. We were decked out with all our camera equipment. 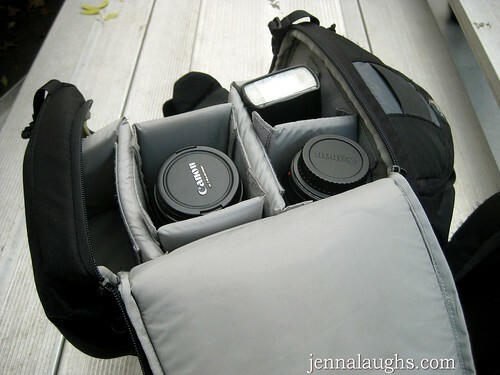 2 bags full of cameras, lenses and flashes. We looked so legit. It was a perfect fall afternoon in Central Park. Plenty of leaves were still on the trees and there was a nice breeze. Lauren looked beautiful of course, and Evan is lovingly referred to as the male model (LOL-Kri, Vic) so he looked handsome as usual. I can't tell you how much fun it was to take their pictures. They are so in love, and very comfortable with each other. I love Lauren so much, it was good for my heart to see her happy. I can't wait until their wedding! This was our second engagement shoot. It was a huge learning experience for us. It's no secret that we are in the works of starting our own photography business. It's something we both enjoy and we make a great team. Michael is a genius when it comes to the technical aspects of photography. He knows the ins and outs of his equipment, he understands lighting and he loves the photo editing process. I am better with people and posing them in creative ways. When we work together, we always create wonderful pictures. I begged Michael to let me post a teaser photo today. He said no... sadly. But trust. The photos are incredible and I can't wait to share them - so stay tuned for that! The rest of the weekend was equally fun. I cooked dinner for all my friends on Saturday night. Michael took pictures, so that recipe is coming this week. We had a hysterical poached eggs experience on Sunday morning. The drive home while sipping our Starbucks tea was relaxing. I am looking forward to only working 3 days this week. Then THANKSGIVING dinner with my family. It's a food blogger's dream. Plus the reveal of Lauren and Evan's engagement pictures. Plus spending lots of time with my boyfriend. I am also considering buying a juicer today. I was in Central Park Saturday afternoon! Would have been so fun to run into you taking those pictures! Can't wait to see them. I love when you post about "your" city. I love New York City, too. The crowds, shopping and sights you never see anywhere else. Oh, those New York bagels and Jamba juice, YUM !!! I smiled the whole time while reading this post! I am so anxious to see the pictures. I know they are fabulous! Thanks for spending the day with us on Saturday - it was so fun to be your guinea pigs and help you perfect your passion! And thank you also for your delicious dinner. I now know how to get Ev to eat his peas - THIS IS MIND BLOWING!! !